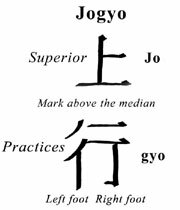 Jo of Jogyo is composed of a horizontal line on the bottom, in the middle of that line is a vertical line (going up), off to the side is another horizontal line. It means above the median, high, superior. This Bodhisattva is always doing his/her best and trying to improve his/her capabilities. Gyo is the same gyo that is in Gongyo. It means continuous (daily) practice. 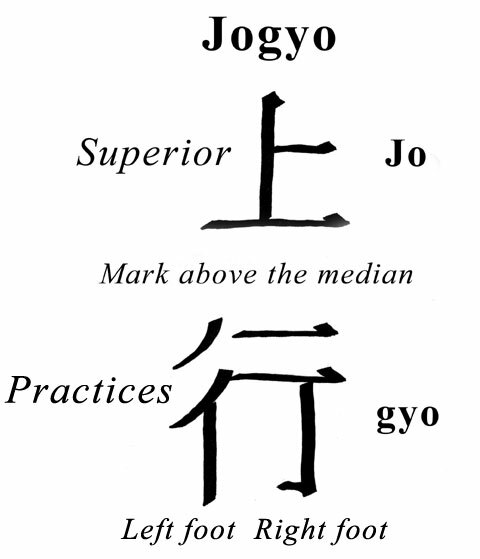 Jogyo corresponds with fire (because like fire it is always rising above the median). Jogyo has all the powers of fire-like illumination.